Jordan Hamilton drives to the hoop. The freshman guard and the Wildcats saw their season come to a close against Iowa on Thursday. 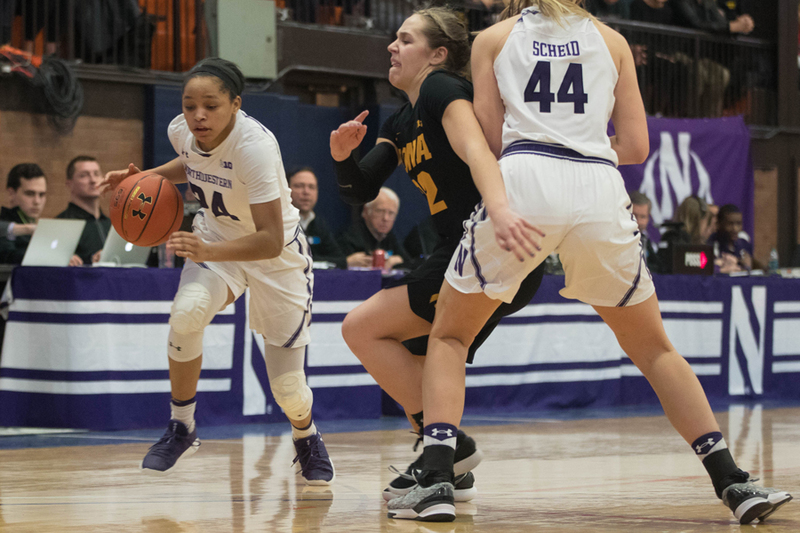 Near the start of Thursday’s game, freshman guard Jordan Hamilton drove to the hoop and attempted a layup, but an Iowa player smacked the ball out and away. Looking exasperated, Hamilton mouthed “come on,” foreshadowing the frustration yet to come for Northwestern. After their win over Wisconsin in Wednesday’s Big Ten Tournament opener, the No. 12 seed Wildcats (12-20, 4-12 Big Ten) lost their momentum and ended their season in the second round, losing 55-45 to fifth-seeded Iowa (24-6, 11-5) in Indianapolis. Coach Joe McKeown said this season was part of the learning curve for the freshmen-led roster, and he expects a stronger team to come out of this experience. Ultimately, the first quarter dug the Cats a grave that they couldn’t get out of. NU scored just one point, on a free throw from junior forward Pallas Kunaiyi-Akpanah, and trailed 22-1 after the period. McKeown said NU was aggressive offensively in that quarter, but had a hard time sinking shots. McKeown said there was frustration specifically in the first, but added that his team did a good job of fighting their way back and slowing down Iowa on offense. The Cats scored 19 points in the second, closing Iowa’s lead to 11 at halftime. The Cats were sparked by Hamilton and freshman guard Lindsey Pulliam, who drew NU closer to Iowa. Pulliam led her team with 17, surpassing her average of 15 points per game. In the fourth quarter, there was a glimpse of hope for an upset as the Cats closed the gap to 5 after a pair of jumpers by Pulliam. Just two minutes later, Iowa extended its lead back to 10, and in the end, that was enough for the Hawkeyes. Hamilton, who added 9 points for NU, said she has high hopes for the future of the team but the emotions of the loss loom heavy. A previous version of this story misstated Iowa’s seed in the Big Ten Tournament. The Hawkeyes were seeded fifth. The Daily regrets the error.